We use the word ‘platinum’ service since we genuinely believe that we offer a gold service to each and every puppy as it stands without fail. In the past few years we have noticed that when we start working with our puppies (i.e. the ones we have chosen from a litter for ourselves) that the extra work we put in from six weeks made a huge difference in the long run. This is now something that is included in every puppy. When I (Anne-Marie!) have brought the puppy on to six weeks of age Richard then starts with their training. He has decades of experience in dog, gundog and puppy training plus working with Uggeshall Spaniels seven days a week and he works within his own entity for your puppy. Anything specific that you require please let him know at your first meeting the pups. At six weeks of age the pups are still with their mother so the first few days is taking the pup out of their kennel with their mother at their side and encouraged to follow their mum and Richard around and about, up the side of the house where we often have thundering lorries and Tractors, into the Orchard to see the other dogs, and on to the field to see the world at large. When the pup is happy with this, Mother is left behind | (usually having a well-earned nap in a sunny spot or in front of the fire in the Office). From this point they should be happily trundling round after his boots, often tripping him up in their closeness. From here the collar and lead comes naturally closely followed by introduction to crates and cars. You are very welcome to post us a bed for your puppy which we will move between car and crate. We have crates set up in the office so pups can spend time in their bed and get used to a crate in their own time. It is incredibly important that pups are socialised with many different people and environments at this early age. hence all pups will be handled by Matilda and Tabitha (Anne-Marie’s daughters) finding the puppies all over the family home in and out of bedrooms and being introduced to YouTube and the like. The socialising also includes various trips around the house whilst our lovely cleaner is wading her way through the house dogs and cats. She has become quite an expert with cleaning and looking after pups at the same time. 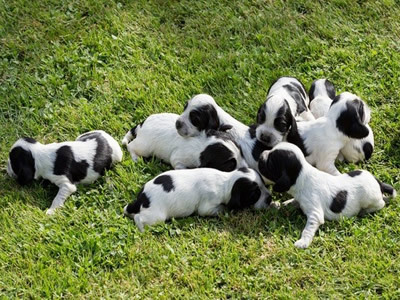 We can now offer an in-house delivery of puppies around the UK. This can be done by our office manager Louise who is an expert on all the processes and procedures in delivering and handing over your puppy. She will also have plenty of time to talk through all the paperwork involved and answering any queries you might have. Both Louise and Richard will bill you separately for their work. If you would like a quote re delivery then please email or text us with your postcode.